Sometimes finding a vegetarian or vegan recipe calls for making it just because it sounds good. Such was the case with “lentil chili” in the recipe name. Had to give it a try and found it very good! Of course, it needed a little more chili powder than called for to satisfy the Gringo Gourmet taste buds. It seemed a bit sweet when tasted during cooking. A couple of teaspoons of rice vinegar balanced the sweetness nicely. 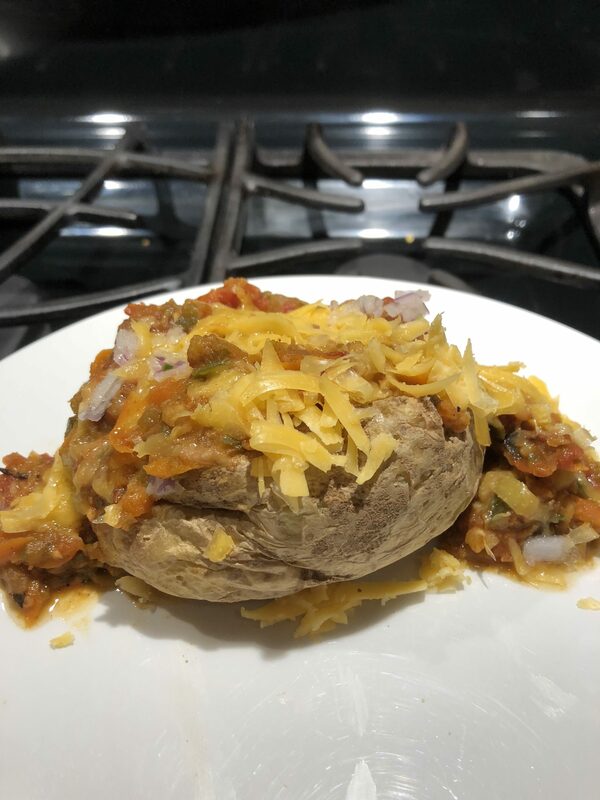 Stuffed potatoes with Lentil Chili – Vegetarian version. Preheat oven to 425º.Prick potatoes with a fork and microwave until tender -15 – 20 minutes. Transfer to oven rack and bake until soft – about 15 minutes. Meanwhile, finely chop the red onion. Put 2 Tbsp chopped onion in a small bowl, cover with water and let soak for 10 minutes; drain, pat dry and set aside for topping. Chop the poblano. Peel and grate the carrot. Heat 2 Tbsp olive oil in a large skillet over medium high heat. Add the remaining red onion, the chopped poblano and carrot, season with salt and pepper. Cook stirring occasionally,until tender – about 5 minutes. Stir in chili powder and cumin and cook about 1 minute until toasted. Stir in lentils and add the tomato paste and cook stirring, until vegetables are coated. Stir in the tomatoes and their juices, 1-1/2 cups water and a large pinch of salt. Simmer, stirring occasionally until slightly thickened – about 10 minutes. Split the potatoes open. Drizzle with the remaining Tbsp olive oil, season with salt and pepper and fluff with a fork. Top with half the cheese, then top with the lentil chili. Sprinkle with the remaining cheese and reserved red onion. NOTE: This is a very good stuffed potato! Omnivore/carnivores can use smaller potatoes and use this as a side dish with a nice grilled steak if desired. 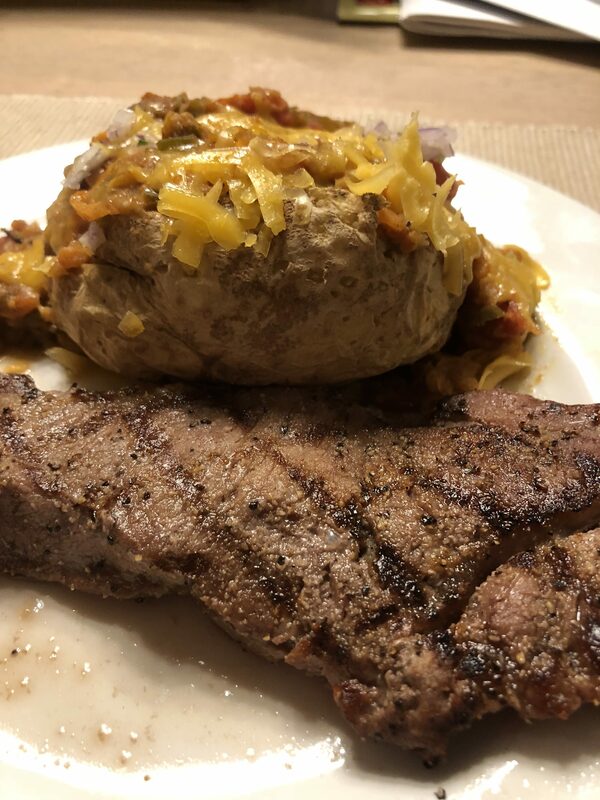 Have it both ways – as a meal with a big potato, or as a side with a smaller potato. As a devoted omnivore with carnivore proclivities the occasional experiment with vegetarian and vegan recipes can be an adventure. It is interesting to see how many “V” recipes are base on a combination of sweet potatoes and black beans. And is is great that this combination works so well in so many different ways. 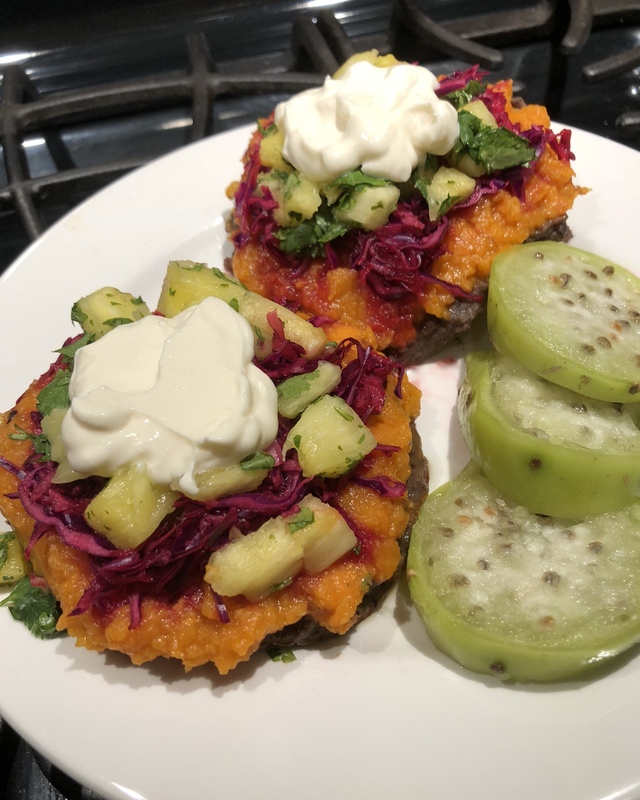 This Sweet Potato Tostadas recipe is about as far removed from a Mexican tostada as one can get, but it is delicious and will probably show up on the Gringo Gourmet menu again! Sweet Potato Tostadas with a side of sliced prickly pear tunas. See note below about the sweet potato topping and prepping the tunas. Put sweet potatoes in a large skillet using enough water to cover, season with salt and pepper. Bring to boil, reduce to a simmer and cook until tender – 20 – 25 minutes. Drain, return to skillet and set aside. Meanwhile, mix the cabbage, 1 Tbsp lime juice and a pinch of salt in a small bowl and set aside. Pineapple Salsa: Toss 1 cup pineapple with the cilantro and 1 Tbsp lime juice in a small bowl and set aside. Pineapple Sauce: Puree the remaining cup of pineapple with 1 Tbsp lime juice, the garlic, chipotle and adobo sauce, cumin and water in a a blender until smooth. Stir this pineapple sauce into the sweet potatoes and cook over medium heat until warmed through – 3 – 4 minutes. Put the black beans into a small sauce pan, add 3 Tbsp water and warm over medium high heat. Spread black beans on tostadas; top with sweet potatoes, pineapple salsa and cabbage. Drizzle with the crema. NOTE: These tostadas boast wonderful flavors and textures, but are very rich. Spread the beans and sweet potato mix thinly. If you spread the sweet potato mix to thick, it can be a bit much! The photo includes a few slices of prickly pear fruit (tunas). Sometimes the fresh tunas from the grocery store are not glochid-free. Carefully check and removes the glochids from the “spots” on the tunas, or peel them. You might like to wear rubber gloves so you don’t get glochids in your fingers. Moles maybe be an acquired taste, but once it is acquired, it is something you’ll crave. I’m enjoying trying Mexican dishes made vegan by chef Jason Wyrick in his new cookbook Vegan Mexico. My own feeling is that vegan never will taste like foods that are not totally plant based. They are good on their own and should be appreciated for that, not compared to non-vegan or non-vegetarian recipes with similar names. Accept and enjoy the differences. In this case, sweet potato and black beans will never taste like mole on chicken or pork enchiladas, but you’ll be surprised at how good they are together in many vegan dishes. I’ll be playing with more recipes from this cookbook and sharing recipes with my vegetarian- can’t give up her dairy and eggs for a vegan lifestyle- daughter and our v-word friends! 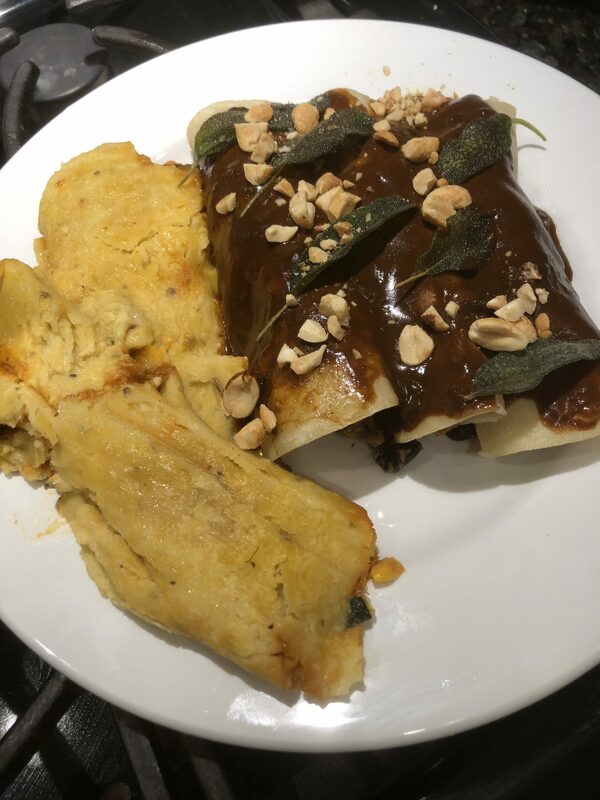 Vegan Mole Poblano and a couple of vegan tamales from the freezer section at the grocery. I love the mole; I like the tamales, and next time I’ll put more red sauce on the tamales! After all the typing this post took, you owe it to me to give this mole a try, even if you use just the short cuts, as I do! Jim’s notes are in italics. Rich depth mole flavor and quick and easy ready-to serve for small batch cooling! Best discovery of my week! Preheat oven to 450°F. Wrap the sweet potato in foil and bake for 40 minutes. Let cool, remove foil, peel sweet potato and chop into 1-inch chunks. Toss sweet potato chunks with Oaxacan-style black beans and set aside. Or, wash and dry the sweet potato, pierce skin all over with a fork, place on a paper towel in your microwave and zap it for 12-15 minutes. Test with a fork. When tender and cool enough to handle, split potato in half. Score flesh vertically and horizontally at one-inch intervals , but don’t cut through the skin into the palm of your hand! Use a table spoon to scoop potato cubes out of skin. How easy, cooler in your kitchen and faster is that? Combine mole poblano, water and salt in a medium skillet. Warm to medium heat. Add ¼ inch of oil to a deep skillet and heat to just above medium. Fry tortillas in oil for about 3 seconds each, then dip on mole poblano sauce for bout 10 seconds. Transfer each tortilla to a “work” plate and add about 2 Tbsp filling. Roll tortilla and transfer to a serving plate or platter. Repeat with all the tortillas and pour remaining sauce over them. Drop the sage into the hot oil and fry for about 45 seconds, remove from oil and sprinkle the sage and on the enchiladas. I like to fry individual sage leaves as a garning for several different dishes. They are delicate to handle, but I find it more attractive and easier to managed that sprinkling fried sage bits. I find Wyric’s Oaxacan-style black beans to be a fascinating recipe. Because I usually cook for one or two, I reduce recipes regularly so I don’t have too many leftovers stacking up in the fridge. I would like to make his recipe one day and compare it with my shortened version. Both are here for your reference. Preheat oven to 275°F. Combine beans, water, onion, chiles, cumin, pepper, cinnamon stick or ground cinnamon, avocado leaves or fennel seeds in a 10-X10-inch baking dish. Mix well, cover tightly with foil and bake for 8 – 10 hours until beans are tender. Serve as is or mash the beans before serving. I guestimated that Wyrick’s recipe would yield about six cups of beans. I used one can of rinsed black beans, figuring that to be about 1/3 of the volume of the original recipe. I tried to use 1/3 of the rest of the ingredients in the recipe. I substituted a heaping teaspoon of ancho powder and about 1/3 chile in adobo for the chiles. I approximated the measure of the other ingredients using a tsp as a tool for eyeballing the amounts. I did use the whole 1/t tsp fennel seed because I love fennel. I crushed the seen in a mortar before adding them to the recipe. I heated the bean mixture through while I did the rest of the prep then followed the enchilada cooking and assembly instructions. I was pleased with the flavor of the abbreviated Oaxacah-ish beans enough to think about making the scratch recipe someday. I said I’d include the homemade Mole Poblano recipe. I think typing it is about as much work as making it from scratch! Add ¼ cup of the corn oil to the skillet. Working one at a time, fry the following individually. Transfer each to the blender as it is finished. Add the remaining oil to the skillet and bring back to medium heat. Working in batches, fry the anchoes, pasillas or additional anchos and mulatos for 30 seconds, taking care not to burn them. Transfer the chiles to a bowl and pour boiling water over them. Leave the oil in the skillet, but turn the heat off. Wait 20 – 30 minutes for the chile’s to rehydrate, then transfer the to the blender along with the tomatoes and garlic. Reserve the chile water. Puree the spice mixture, slivered almond mixture and chile mixture adding enough of the reserved chile water as you blend to create a smooth sauce. Press through a fine-mesh strainer for the smoothest sauce. Bring the oil in the skillet to medium low heat. Add the sauce, Mexican chocolate, piloncillo or turbinado sugar and salt to the skillet. Slowly simmer for at least 40 minutes until oil pools on top of the mole. As the mole thickens, add just enough water to keep it from sticking to the skillet. If you have time, let the mole simmer for 1 to 2 hours. The longer the better. According to Myrick, you can save time by using ground spices and not toasting them. You scan skip frying the almonds and pepitas by buying the pre-roasted and salted. You can add the chiles, onion, raisins and plantain to the blender without frying them, but the result won’t be as rich-tasting. 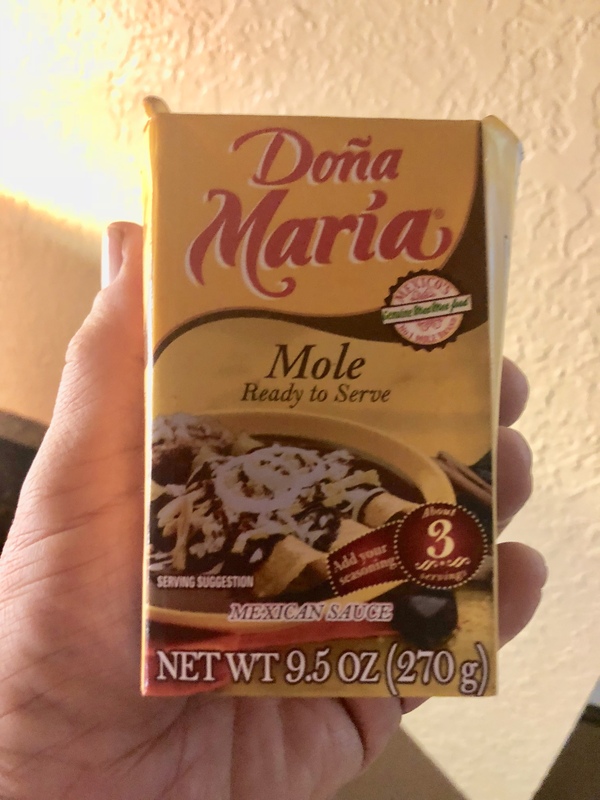 The greatest time saver is buying a jarred mole poblano sauce such as Doña Maria because it is vegan and commonly available in Mexica or larger supermarkets. Wyrick recommends adding ½ cup caramelized onion to the jarred sauce and puree it. Leftover and Some Left – Check these ideas out, Sarah Chesters! A few days ago, I posted a pic and comment on cooing a pot roast on FaceBook. I received some complements and a few comments about pot roast nostalgia. There also was a request from my friend Sarah Chesters for ideas on what to do with left over pot roast because she, too cooks for one. It all began with discovering a recipe a Peppery Beef Stew in the new issue of Cooking Light magazine. I wanted to try it because it had turnips and celery root and no potatoes among the vegetables. It was different from my usual pot roast or stew and it is a keeper recipe! The recipe called it a stew. Starting with a 2+ chuck roast, I call it a pot roast! 2 Tbsp unsalted tomato paste** to recipe. Heat olive oil in a Dutch oven over medium high. Sprinkle roast with ½ tsp pepper and ½ tsp salt. Add roast to pan and cook until browned – about 5 minutes per side. Remove roast from pan and set aside. Add garlic to pan; cook, stirring constantly, 1 minute. Add wine to pan; cook until reduced by half, about 2 minutes, scraping bottom of pan to loosen browned bits. Whisk flour and stock together in a small bowl. Stir stock mixture into wine mixture; cook stirring often until thickened. Stir in tomato paste, thyme, bay leave and remaining 1-1/2 tsp pepper and remaining tsp salt, remember to taste for salt if using salted stock and tomato paste. Nestle roast into stock mixture. Cover and bake at 350ºF on hour and 30 minutes. *If you cannot find unsalted beef stock, use low sodium stock and don’t add salt to liquids until later in the cooking process, then taste and adjust salt. ***If you agree with me that peeling fresh pearl onions is a hassle, use about 8 oz Mexican green onions – white bulb only, halved or cut in wedges instead. They are attractive and easy to manage. You can also use wedges of a small white onion. 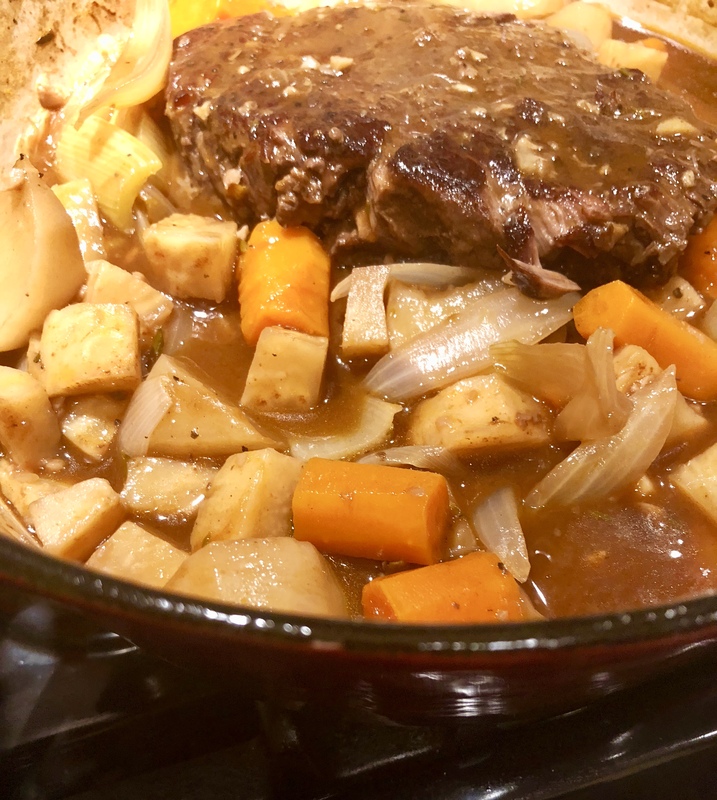 Still enchanted with the root vegetables, I deduced to thicken the sauce of the roast/stew and serve it with Amish-style thick noodles and even more black pepper. The vegetables were even better after a couple of days in the fridge! Below is a technique I use for making a basic white sauce in the microwave to thicken something. If I am going to make a white sauce to serve as a major part of a recipe, I do the traditional roux-building process. 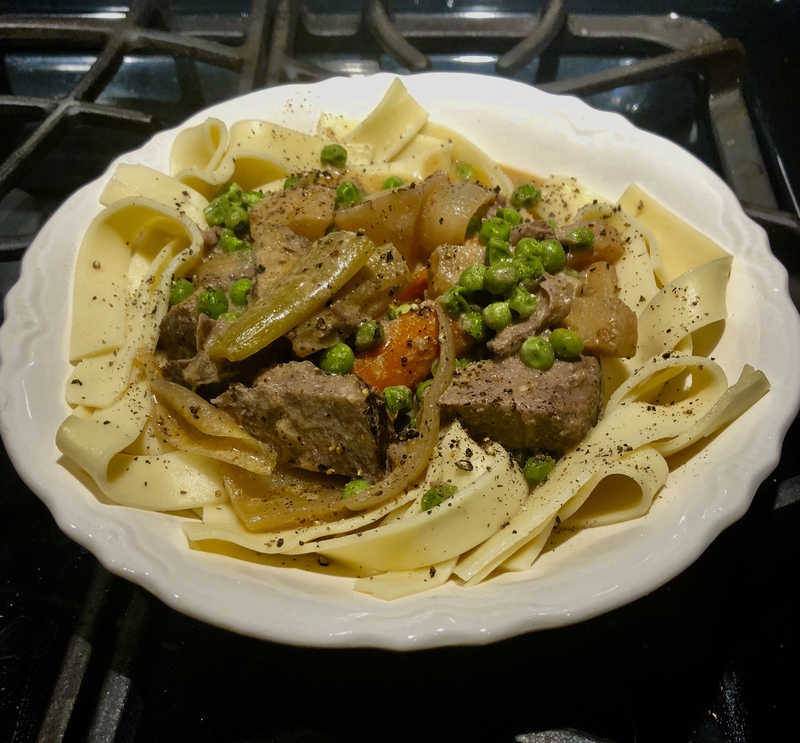 Amish-style noodles, a handful of English pease and cubing the beef make the left over pot roast new again! Cream, half and half, milk or cooking liquid as noted below. Blend fat and flour in a two-cup microwave safe measure or bowl. Zap for thirty seconds, stir and taste. Continue to zap at thirty seconds until mixture thickens and does not taste like raw flour. The amount of fat and flour you star with will determine how many zap cycles you will need. Add your liquid of choice in small amounts, stir and zap. It will thicken rapidly. Add more liquid, stir until smooth and zap again. Repeat until you get a smooth texture of white sauce in your measure or bowl. Do not over thin in your measure, you want the white sauce to thicken what is in your pan or pot! Add mixture in small amounts to liquid in your pan or pot. Stir to keep it smooth as it thickens to desired texture. This is not a roux or gravy base. It is a simple white sauce thickener that I find easier to work with than dealing with a roux for some recipes. Getting the flour cooked is the critical factor for flavor. Fish the left over hunk of pot roast out of the storage container. Cut a few thin slices across the grain and blot them with paper towels to remove cold sauce. Return the bit hunk back to the container and refrigerator. Schmear a couple of slices of your favorite bead side to side with mayonaise, then add a generous schemer of whole grain dijon mustard on one slice. Top with a slice or two of a good shop cheddar cheese, lettuce, tomato onion and /or sliced kosher dill pickle and enjoy. If you are feeling fancy, toast the bread first. And remember, a cold roast beef sandwich tastes best when eaten over the kitchen sink. And don’t for get a side of milk and chips right from the bag, if you have them.No incriminating photos of enjoying a sandwich over the sink were taken. This idea includes leftover and some ingredients left on hand from other dishes. Part of the left over roast was cut across the grain into a couple of thick slices. I had a few baby potatoes left from previous recipes, and part of a head of red cabbage left from another. Microwave the potatoes for 4 minutes, then cut them into wedges. Light spritz the wedges with cooking spray and finish to crisp and brown a bit in a hot skillet. Call them instant sort of Frenchish Fries. Remove from pan and set aside. Cut a few shreds of red cabbage and toss with a mix of equal parts mayonnaise and cider vinegar, a good spoonful of dijon mustard, salt and pepper and a couple of generous shakes of garlic powder to make a colorful cole slaw. Heat roast slices in the skillet and add a few spoonsful of a good barbecue sauce. It will tend to splatter, so be careful! I have an interesting olive, raisin and almond mix from Whole Foods that I love. 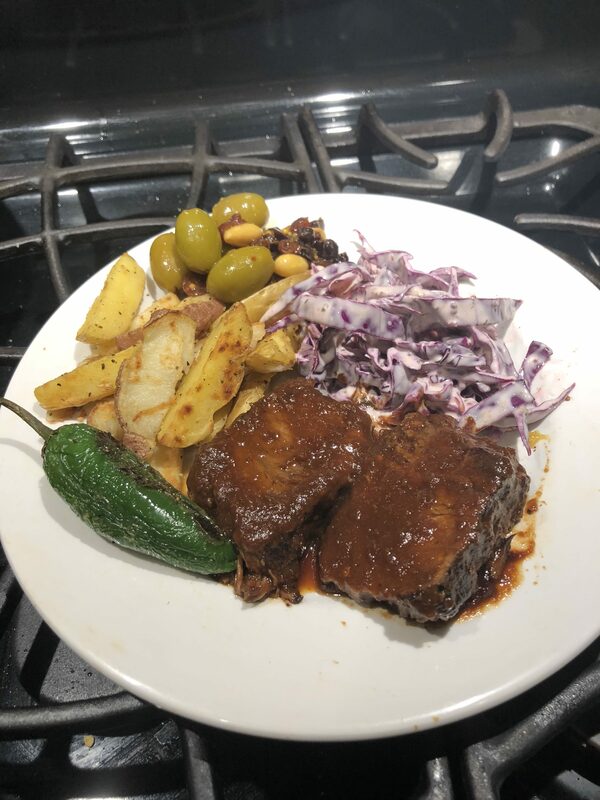 I served this “barbecue plate” with a he olive mix to temper the spicy elements. Barbecue plate from leftover pot roast and a few ingredients left from other recipes. I should have added a few onion slices – maybe next time. The pot roast barbeque was a little on the tender side, but the flavor was very good. New Fall Recipes Get Me Excited! … Charred Red Cabbage with a Butternut-Miso Mash, for instance. Mid-September and our daytime temps are still in the high 90’s! Food magazines from more temperate climes are featuring tempting recipes and photos for soups, stews, braises and tempting riffs on harvest vegetables that have me doing fall cooking despite the heat! I found a brilliant photo of Charred Red Cabbage with a Butternut-Miso Mash that I just had to make. I wanted to try it so much that I waited two days for white miso to arrive at the grocery store. It was worth it! The butternut-miso mash is a puree of butternut squash, butter, white miso and crushed red pepper. Red cabbage is pan charred on the stove top and it is all brought together with a drizzling sauce of toasted sesame oil, lime juice, lower-sodium soy sauce, honey and fresh ginger. Garnished with fresh cilantro and cashews, it all came together with a slightly Asian feel. I made is as the recipe instructed, but when I make it again, I’ll add more crushed red pepper. As a border guy, I crave more heat than northerners would. Also, when it came time to do the dishes, I found the flavors in the mash had come together and were more satisfying than when they came right out of the food processor. I think this recipe was created as a side dish. 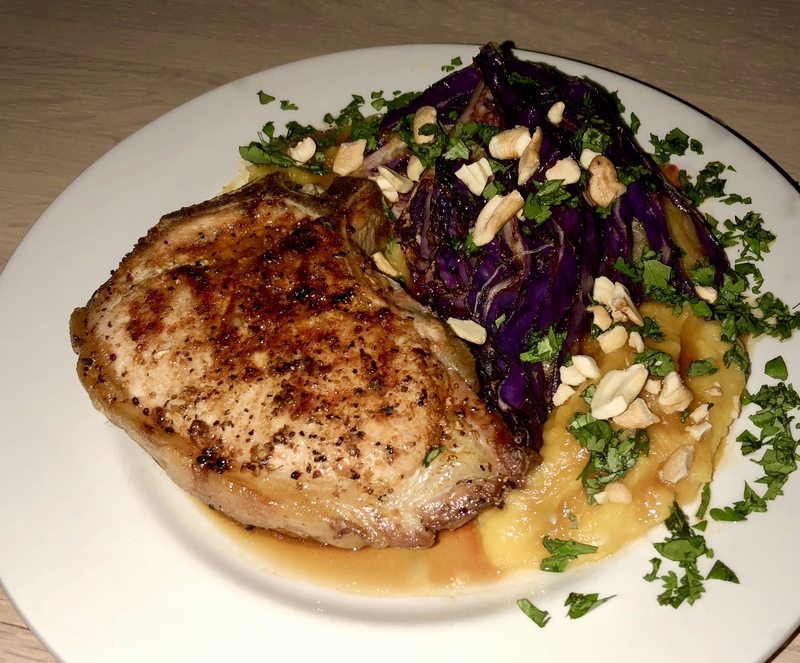 My meal needed protein, so I grilled an inch-thick pork chop with Williams-Sonoma’s Habanero Citrus Rub. It was a good compliment for the Asian-feeling mash and cabbage and, surprisingly, was not overly spicy from the habanero chile. I wonder why I haven’t been using it more often! I think white beans – navy, great northern or cannellini – with a hint of garlic or onion might be a good way for vegetarian or vegan folk to add protein. Bring a large saucepan of water to a boil. Adds Squash and reduce heat to medium; simmer until tender – about 10 minutes. Drain. Combine squash, butter, miso, garlic and red pepper in a food processor. Process until smooth. Cut cabbage in half lengthwise. Cut each half into four equal wedges. Heat canola oil in a large heavy skillet over high. Add cabbage, cut sides down; cook until charred, about five minutes. Flip cabbage and cook until charred on second side. Remove from pan and sprinkle with salt. Stir together sesame oil, lime juice, soy sauce gibes and ginger in a small bowl. Place 2/3 cup squash mistuned in each of 4 bowls. Top evenly with cabbage wedges and drizzle with sesame oil mixture. Garnish with cilantro and cashews. NOTE: Because I was serving this as a side dish, I plated it with the pork shop instead of using a bowl. When I make this again, I’ll make the butternut-miso ahead of time and let the flavors blend more. I liked the drizzling sauce so much, I’m going to make more and try it on grilled chicken.